The UK’s wildest and most inspiring independent festivals, a sprawling creative metropolis and home to every species of artistic miscreant! This is an immersive audio-visual joyride, dancing through the labyrinthine streets and plazas on a non-stop weekend journey of discovery! A pop-up city where the impossible is possible and the abnormal is normal! 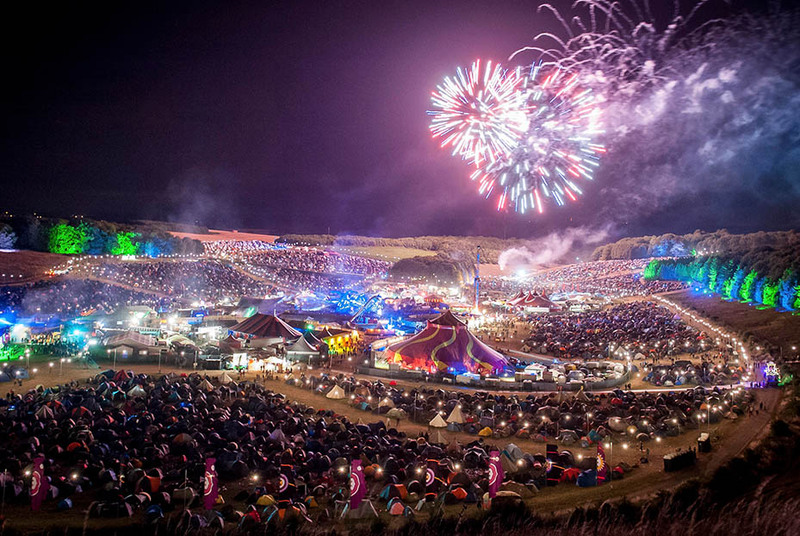 BoomTown Fair is a music, arts and theatrical independent festival that celebrates ska, reggae, dub, swing, folk as well as dedicated areas for the whole family with arts, crafts and workshops. BoomTown hosts limitless winding streets and eccentric venues to explore and is a fully working city created by an ever expanding network of artists, craftsmen and imaginative minds. BoomTown’s enhanced craft, healing and chill-out district has seen an explosion of workshops, talks, green initiatives and acoustic wonders; all nestled in a magical and serene clearing amongst the treeline of the grassy suburbs of the City! Lost Horizon returns to BoomTown! Described by many as a festival within a festival, our healing recovery space provides grounding and sacred time to unwind and rejuvenate away from the bustle and mayhem. Melt in a hammock, recharge in the sunshine or lounge by the fire in the tipi. The luxurious wood-fired yurt sauna is sizzling from 8am and now into the night. Available at reception, a Lost Horizon wristband allows entry throughout the festival. The solar powered stage kicks off mid morning, running to late afternoon with shows ranging from gentle acoustic and folk to swing and gypsy jazz to Celtic, Balkan and bluegrass. Hire a fresh clean towel, secure your valuables, charge your phone with solar power and book your massage or specialist treatment at reception. You’ll find a comfortable yurt for your clothes, showers, plunge pool, warm and cosy tipi, large lawn for sunbathing and a central fire. From felt making workshops to yoga, hula hooping to talks on Permaculture, share your knowledge and skills and help us through this time of transition or just enjoy play in the sunshine – the space is entirely participatory. Get involved as the mood takes you. BoomTown comprises 9 distinct districts that revolve around the Heart of the City before branching out into suburbia, each one bringing with it a unique theme and musical flavour to cater for all tastes. Situated centrally are OldTown (Pirates, Balkan & Gypsy), TrenchTown (Reggae and Dub), Mayfair Avenue (Electro Swing and Glamour), Wild West (Bluegrass and Cowboys), Whistlers Green (Folk and World Music), and KidzTown with PG rated musicians, workshops, and a wide array of interactive games! Equally as intriguing, in The Outskirts, beyond the city’s rapidly beating heart, the intrepid explorer will discover Barrio Loco (Breaks and Bass), DownTown District (Drum & Bass and Jungle) and ChinaTown (Ska and Punk). But the essence of the city is far greater than the sum of its musical parts. A theatrical plot, played out by hundreds of supporting cast members, unfolds within the Fair, drawing together events that transpired over the past year, before exploding in dramatic climax. This year, 2014, unveils Chapter Six: A New Twist! – a storyline concerning old rivalries, new alliances, underhand tactics, time-travel, and the volatile predicament of Wild West meets Carnival! BoomTown has grown organically from a grassroots vision of wanting to provide a platform for like-minded individuals to come together and enjoy the music, art and culture they love in a fun, engaging and positive environment. To fully appreciate the extent of BoomTown’s immersive fantasy world, come and join us this 7th – 10th August! Everyone is invited to discover our great city and become a character in one of the most spectacular shows on Earth!